National Council of Science Museums (NCSM), an autonomous scientific organization under Ministry of Culture, Government of India is primarily engaged in popularization of Science among the people. 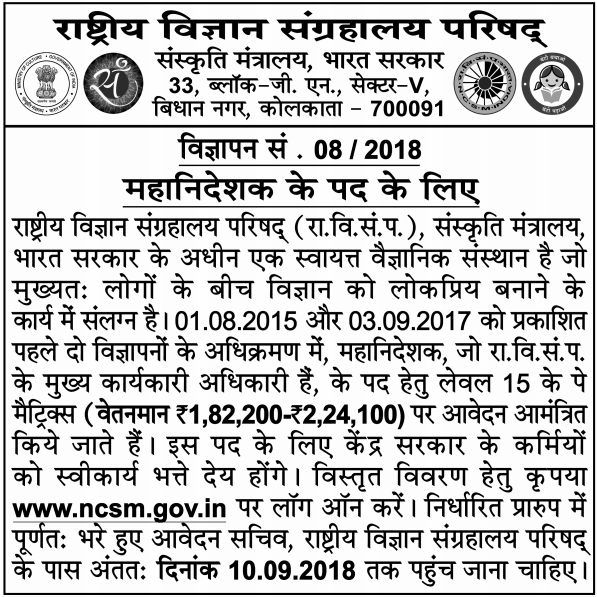 In supersession of the earlier two advertisements published on 01.08.2015 and 03.09.2017, applications are invited for the post of Director General, who is the Chief Executive Officer of NCSM, in the Pay Matrix of level 15 (Rs. 1,82,200-Rs. 2,24,100). The post carries usual allowances as admissible to Central Government employees. For details, please log on to www.ncsm.gov.in. Completed applications hpw in the prescribed format should reach the Secretary, National Council of Science Museums latest by 10.09.2018.